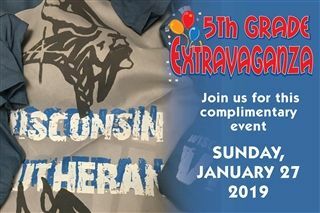 All 5th graders and their families are invited to join us on Sunday, January 27, at 5:30 p.m., for our annual 5th Grade Extravaganza. Come for an exciting evening of food, fun and entertainment. Students and parents will have a chance to learn about our caring, Christian environment, superior academics, award-winning co-curriculars, generous tuition assistance, and other amazing opportunities that WLHS offers. The 5th grade students will tour the building in the form of a scavenger hunt, see science demonstrations, and be eligible for door prizes. To register for this fun-filled event, click here.